US crude inventories rose by the most in a year last week. But markets are focused on oil sanctions against Iran that take effect next month. Oil prices rallied to near four-year highs Wednesday, erasing earlier losses as markets weighed the largest rise in US crude inventories this year against looming oil sanctions against Iran. Brent, the international benchmark, rose more than 1.5% to nearly $US86 per barrel. West Texas Intermediate gained nearly $US2 a barrel to trade above $US76. 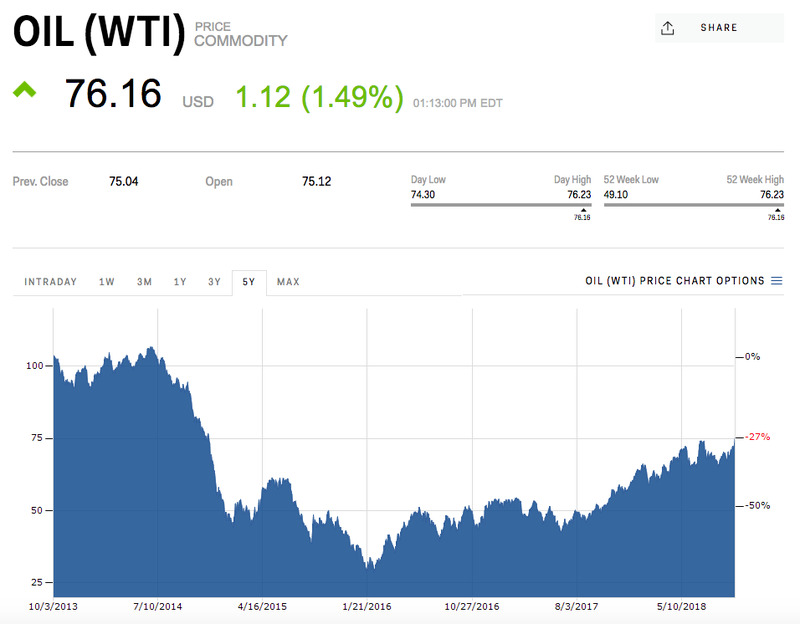 Prices had tumbled in earlier trading after the Energy Information Administration reported an eight-million-barrel rise in US stockpiles last week. But the surprise buildup failed to calm supply concerns that have bolstered prices since President Donald Trump’s decision in May to withdraw the US from the Iran nuclear deal. As part of that move, the State Department has called on buyers to stop importing barrels from Iran by November. As the third-largest producer within OPEC, analysts say cutting off crude exports from Iran could make maintaining global supply a challenge. The Trump administration has looked to Middle Eastern producers to pick up the slack left by its policy, with Saudi Arabia agreeing earlier this year to increase its oil output by a “measurable” amount and OPEC agreeing to reduce compliance with coordinated supply constraints. Analysts remain sceptical OPEC and Russia will be able to offset the expected supply squeeze, especially as Venezuela and other key oil countries face the risk of output disruptions. “Any unforeseen outages…could potentially expose the lack of OPEC spare capacity at this stage – particularly that of Saudi Arabia,” JPMorgan wrote in a recent note. It remains unclear if the US will grant sanction waivers to countries in an attempt to avoid supply shocks. Administration officials have said they might look at requests on a case-by-case basis, while also maintaining that the goal is to cut Iran’s exports to zero. If no waivers are extended, JPMorgan said oil prices could quickly rise to $US90 per barrel.